Ever since the launch of Reliance Jio, telecoms have been waging wars to entice more subscribers with cheapest possible plans. Jio recently extended the validity of its ₹98 plan – which offers 2GB data and unlimited calling – to 28 days under the Republic Day 2018 offer and to match up, Bharti Airtel has extended the validity of its ₹93 plan. 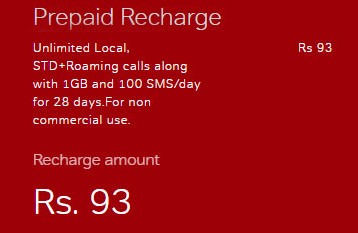 The ₹93 plan by Airtel is meant for consumers who have a higher requirement for calling credits than mobile data and offers 1GB 4G/3G data, unlimited calling, and 100 SMSes per day. The validity of the plan was earlier 10 days and has now been increased to 28 days to compete against Jio’s plan. The plan is available, as TelecomTalk reports, for most users in the Andhra Pradesh and Telangana region and for select users in Mumbai, Delhi, and other circles while for other users, the validity remains to be 10 days. Please bear in mind that the “unlimited” calling is limited to 250 minutes daily and 1,000 minutes per week. Additionally, users are permitted to only call 100 unique numbers. Once usage exceeds any of these parameters, users are charged at 2p per second for both local and STD calls. While Airtel’s plan falls short of Jio’s ₹98 pack in terms of data, it eclipses the latter’s SMS allowance with 2800 local and STD SMSes for the same validity compared to only 300 SMSes offered by Jio. Meanwhile, Vodafone offers 1GB of 4G/3G data for ₹95 but there is no other benefit that you get from the plan. At the same time, Idea Cellular offers 1GB 3G data along with unlimited calling for ₹93 for a duration of 28 days. In case you have higher requirements for data, you can opt for the ₹149 plan by Airtel which offers 1GB 4G data per day along with unlimited calling, free roaming, and 100 daily SMSes. Comparatively, Jio’s plan for the same value edges out Airtel’s by offering 1.5GB 4G data along with 100 SMSes per day, bundled with free unlimited calling.